Amid Panama Papers, Progress Made To Rein In Shell Corporations; More Action Needed Global organizations have been trying to rein in the abuse that costs governments hundreds of billions of dollars. But the Panama Papers revelations show the extent to which more work is needed. 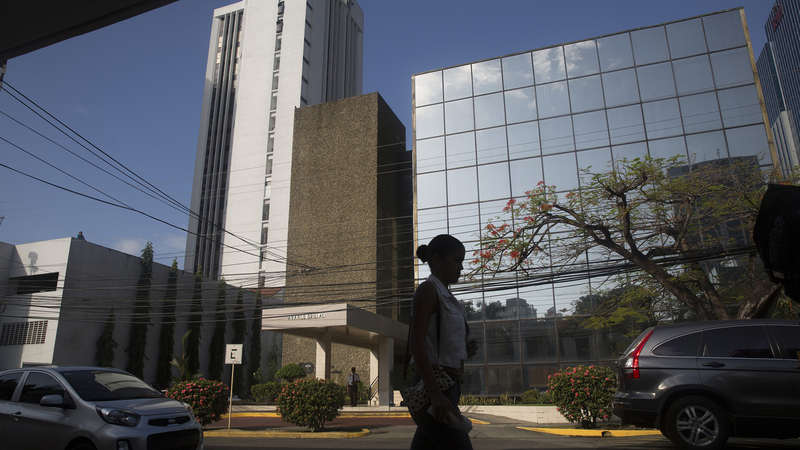 A pedestrian walks past the building housing the offices of Mossack Fonseca in Panama City, Panama, on Tuesday. The massive trove of emails, contracts and other papers from the law firm is being called the largest document leak in history. Pascal Saint-Amans, of the Organization for Economic Cooperation and Development's Global Forum on Transparency, says global commitments to reduce banking secrecy are changing the way former tax havens are doing business. "If we take Switzerland, if we take Luxembourg, if we take Bermuda, Cayman Islands, Jersey, Guernsey, Singapore, Hong Kong — they have all committed to major change," he says. Back in 2009 in the aftermath of the global financial crisis, the G-20 nations, with the support of the U.S., agreed to push for greater transparency to curb the tax evasion made possible by secret offshore bank accounts. Here's how: If a U.S. citizen sets up a bank account in Switzerland, for instance, the Swiss automatically provide information on that account to U.S. authorities, and vice versa. Saint-Amans says most countries have signed on. "Panama is almost the only ... significant financial center which has refused," he says. Most countries have committed to the new level of transparency, but not all have implemented those commitments. And there are other outstanding issues that need to be dealt with, says Heather Lowe of an organization called Global Financial Integrity. "What the OECD is working on is very narrow in that it's looking only at tax evasion," she says. Lowe says that focus doesn't deal with another big part of the problem — money-laundering through shell corporations. And, she says, those shell companies can still easily be set up in the United States. That's because currently anyone can create a corporation in any state without identifying who really owns or benefits from it. To create a company in Iowa, for example, you need to provide the name of the company, the number of shares, and a couple of other things — but not the name of officers, directors or shareholders. "Iowa has no idea who owns and controls the companies ... and that's frightening," Lowe says. That's one reason Mossack Fonseca, the Panamanian law firm at the center of the scandal, set up an office in Las Vegas. Nevada is an easy place to create a shell company. Bipartisan legislation introduced in Congress would require states to collect information on the true owners of companies, and the Obama administration has proposed a regulation that would require that banks ask for the name of real owners for accounts they set up. Lowe says she is confident change will come. "If you'd said to me in 2009 that we would be where we are today on these issues, I think I would have laughed," she says. "We have made a huge amount of progress in a very short amount of time." But she says much work is left to do. And, she says, the problem of secret accounts, corruption and tax evasion will never be completely solved.